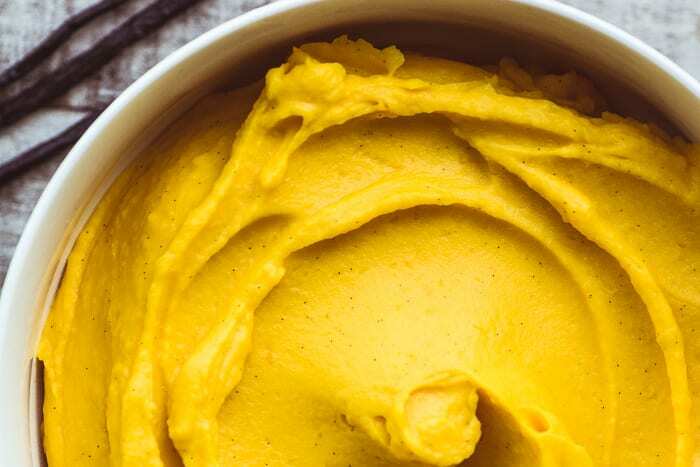 This Whipped Kabocha Squash recipe with vanilla bean and nutmeg is a winner ~ take a chance on this one, guys, trust me, the texture is dreamy and the flavors are out of this world. I don’t think I’ve bought one acorn or butternut squash yet this season ~ I’ve been completely obsessed with kabocha. This Japanese variety of winter squash has stolen my heart with its crazy creamy texture (there’s nothing watery or stringy about it,) and that deep rich color, which you already know means tons of beta carotene. The fluffy texture of the cooked kabocha flesh means that it whips up into one incredible side dish. Mashed potatoes don’t stand a chance against this. I decided to add the vanilla bean and nutmeg at the last minute as I was standing over my freshly whipped squash and, oh wow, was that a good call. There’s no sweetener in this dish, so it’s not like the cloying sweet potatoes or yams you’re used to. This is light and savory, with a hint of spice. The vanilla bean gives an aura of sweetness without actually having to resort to brown sugar or marshmallows. TIP: Vanilla isn’t just for sweets, you can use it to enhance all kinds of dishes, sweet and savory. When I use vanilla in savory dishes I always use the bean and its seeds for the best flavor. You’ll find kabocha with the other winter squash in your produce section. They come in varying sizes, and you’ll want one at least 3 pounds for this recipe. If you’re feeding more than 4 people, pick up more. 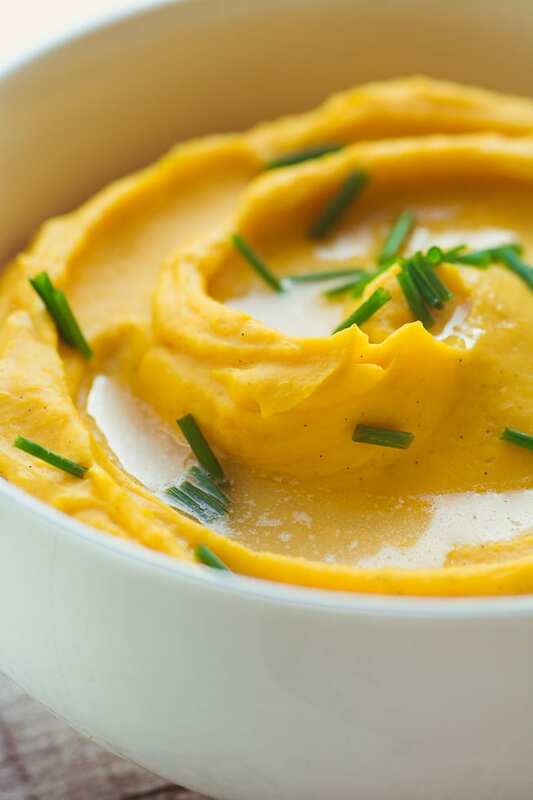 You can use kabocha in any recipe that calls for pumpkin, hubbard, or acorn squash. I find the easiest way to cook it is to roast it whole, then cut it in half, scoop out the seeds, and then the flesh. Check out my Whole Roasted Kabocha Squash with Chipotle Butter if you’d like to try it in wedges rather than mashed. TIP: Kabocha squash are in season in fall and winter, but you can find them year round because they continue to ripen after being picked. The flesh actually gets sweeter as it ‘ages’. Choose winter squash that feels heavy for its size. TIP: If you want to make this ahead, reheat gently with some stock or half and half and a little more butter. Whisk well to keep it smooth. Pierce the skin of the squash with the tip of a sharp knife a few times and put on a baking sheet. Bake for 60 minutes or until the flesh is soft when pierced with the tip of the sharp knife. Let cool slightly and then slice the squash in half. Scoop out the seeds, and then scoop out all the flesh with a large spoon. Put the kabocha in the bowl of a food processor fitted with the metal blade. Add the butter, half and half, vanilla seeds, and nutmeg. Process until completely smooth. 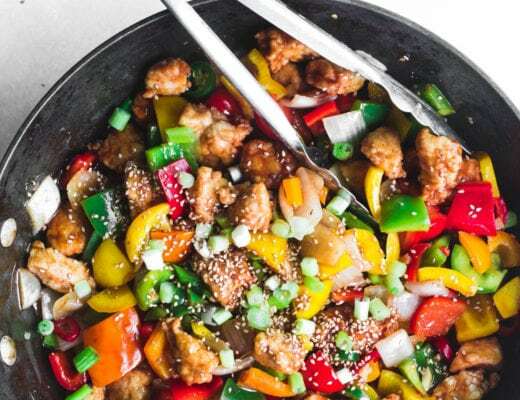 Add salt and pepper to taste and pulse to combine. Add more half and half if you'd like a thinner puree. Sppon the squash into a serving bowl and serve with more butter and snipped chives. 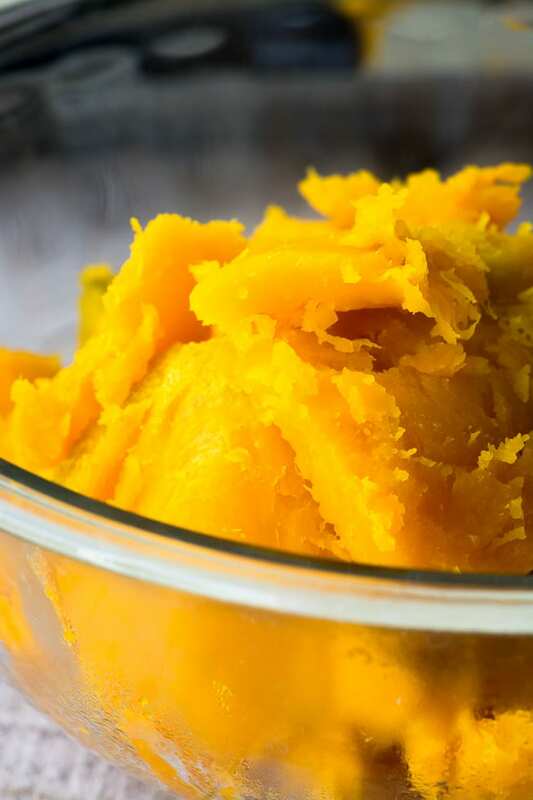 For this kabocha squash recipe I used my food processor to whip the squash. You could use a potato ricer, or hand held beaters, but the texture will be different. Be sure the squash is fully cooked and soft before you whip it. 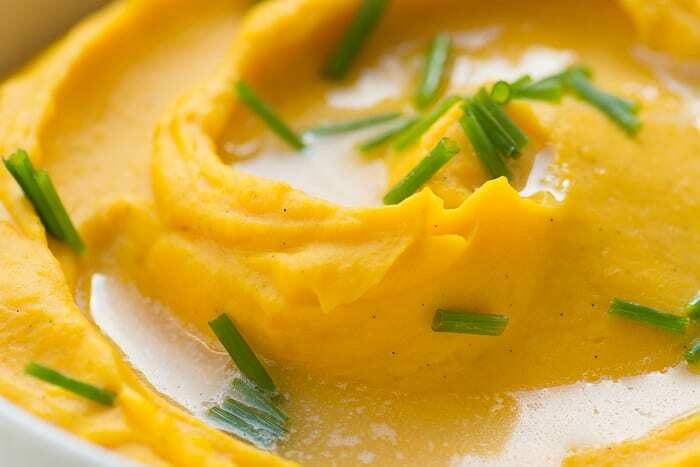 don’t forget to pin this easy Whipped Kabocha Squash! Apparently they can last all winter in a cool dark place ~ enjoy! It’s not so easy for me to use our oven. Can this be cooked on the stove top? Well, the problem with winter squash is that they are hard to peel, Kimi. In order to boil the squash you’d have to remove that peel. Do you have a microwave? I haven’t tried it, but I bet you could microwave the squash. Just cut it in half, scoop out the innards, pierce it a few times with a knife, lay it face down on a plate and microwave until tender. You’d have to do it in 2 stages, one half at a time. Then scoop out the flesh and proceed with the recipe. That is squash perfection right there! Love the beautiful colour and the vanilla and nutmeg flavourings are perfect. Wow this is so gorgeous! It looks silky smooth and absolutely delicious. 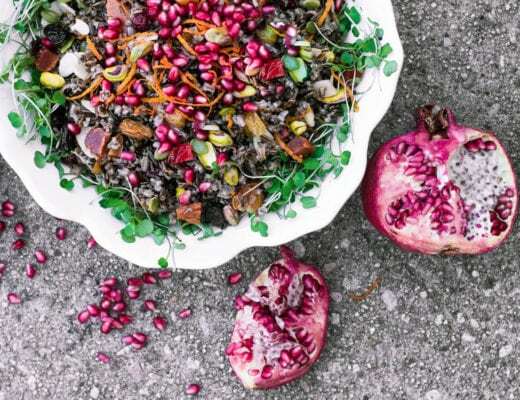 We made your other baked kobacha squash recipe and loved it. Served with butter and maple syrup it was like dessert. I’ll have to try this one too then! Please pass me a spoon! This looks incredible! 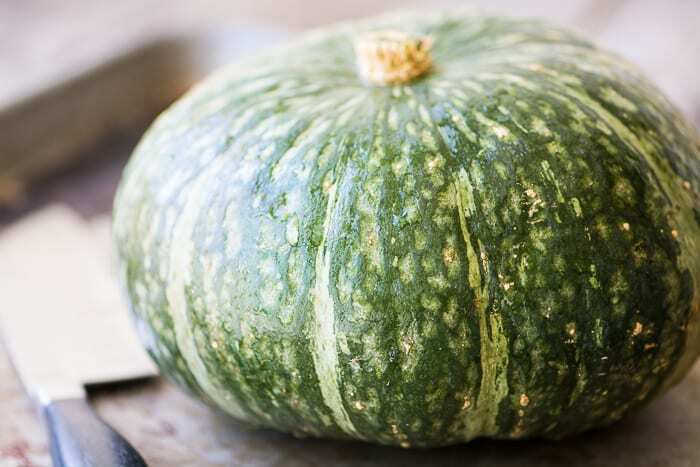 We never made this type of squash before but Love the gorgeous color and silky smooth texture. Beautiful photos Sue- as usual!! Give me a spoon and step aside, please! OMG – it’s gorgeous, and that melty butter — *sigh*. Pinned! I’ve always been a veggie lover, Lisa, and whatever else I find on my plate I always attack the vegetables first…so I’ll fight you for that spoon! This sounds delicious and you have won me over on it! At first I thought vanilla wouldn’t go in a savoury side dish but I feel I could give it a go. I haven’t had a kabocha squash yet this year but I roasted and stuffed one last year and it was delicious so it’s definitely a variety I need to try and get again. The vanilla bean seeds really make a difference, Cornia, they are subtle and lovely. I save the pods to flavor sugar, or hot cocoa, etc, so nothing goes to waste. I made kabocha squash a while back, for the first time. I roasted mine but now need to try your method! This looks fabulous! I often see Kabocha Squash but I never knew what to do with it as it was unfamiliar to me. 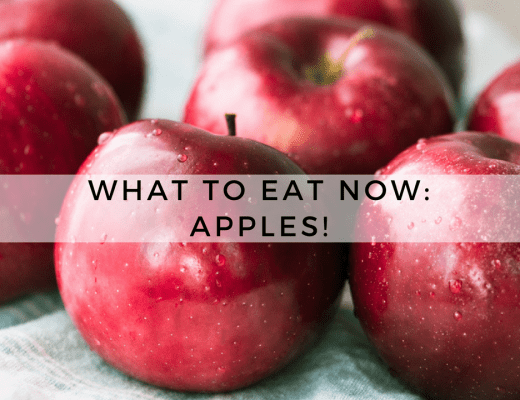 I know my family will love the taste of this–I’, pinning it! This is something I’d definitely like to make, even though I’ve never had Kabocha before. I’m curious to know if one were to use vanilla bean paste in place of the seeds, how much to use. About ½ teaspoon? I’ve never worked with vanilla beans, and have no desire to, but I have an excess of vanilla bean paste from our visit to Tahiti earlier this year… Thanks. I have not tried Kabocha squash before but it certainly looks lovely and creamy. What a beautiful dish! There’s a whole new squash in town! (well probably not new…but new to me..lol!). Beautiful pics as usual! Such a gorgeous color! And yes, kabocha is the creme de la creme of squash! It looks so silky smooth in this recipe! Pinning and sharing!